Reducing MTTR is one of the mantras of IT Operations departments around the world, but in today’s elaborate IT environment, it’s a complex issue. The timely resolution of issues is closely tied to the ability to effectively conduct root cause analysis (RCA) and IT Ops are hampered. 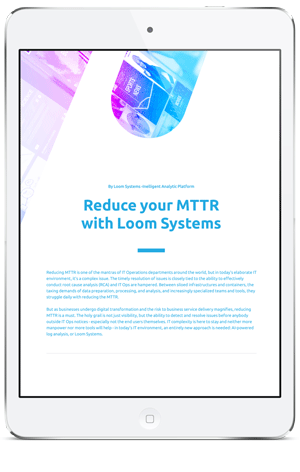 Between siloed infrastructures and containers, the taxing demands of data preparation, processing, and analysis, and increasingly specialized teams and tools, they struggle daily with reducing the MTTR. The holy grail is not just visibility, but the ability to detect and resolve issues before anybody outside IT Ops notices - especially not the end users themselves. IT complexity is here to stay and neither more manpower nor more tools will help - in today’s IT environment, an entirely new approach is needed: AIOps solution, or Loom Systems.